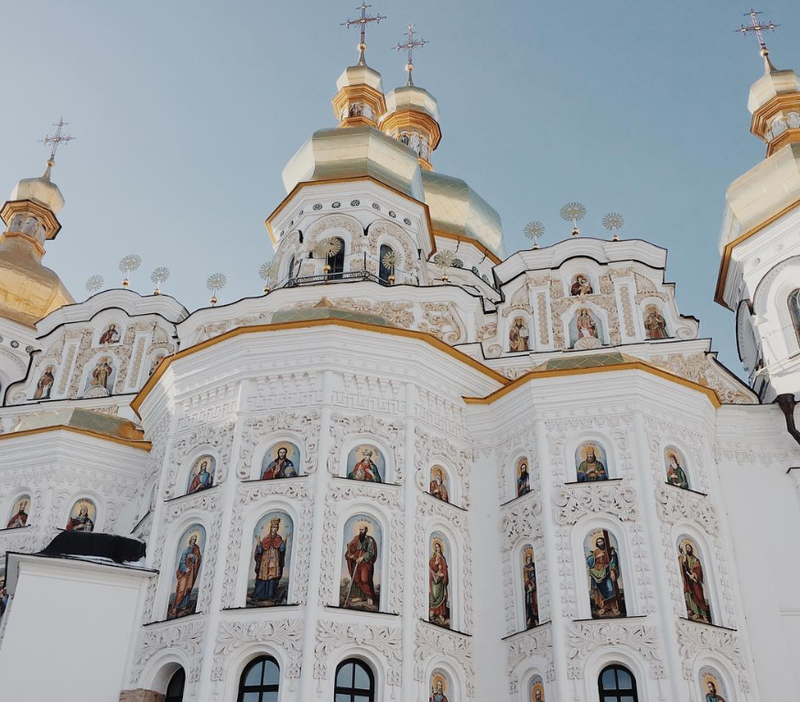 With such an incredible amount of things you can’t miss, you’ll want to follow our guide to Kiev, Ukraine to make sure you don’t miss the insider spots. If vacationing in Ukraine isn’t on your bucket list, it should be. Hiding in Eastern Europe, this gem of a country is home to hillsides adorned with colorful cathedrals, a culture entrenched deep in history, with museums galore. Oh, and it’s also boasting a dreamy coastline where you can lay on the shores of the black sea under swaying palm trees. 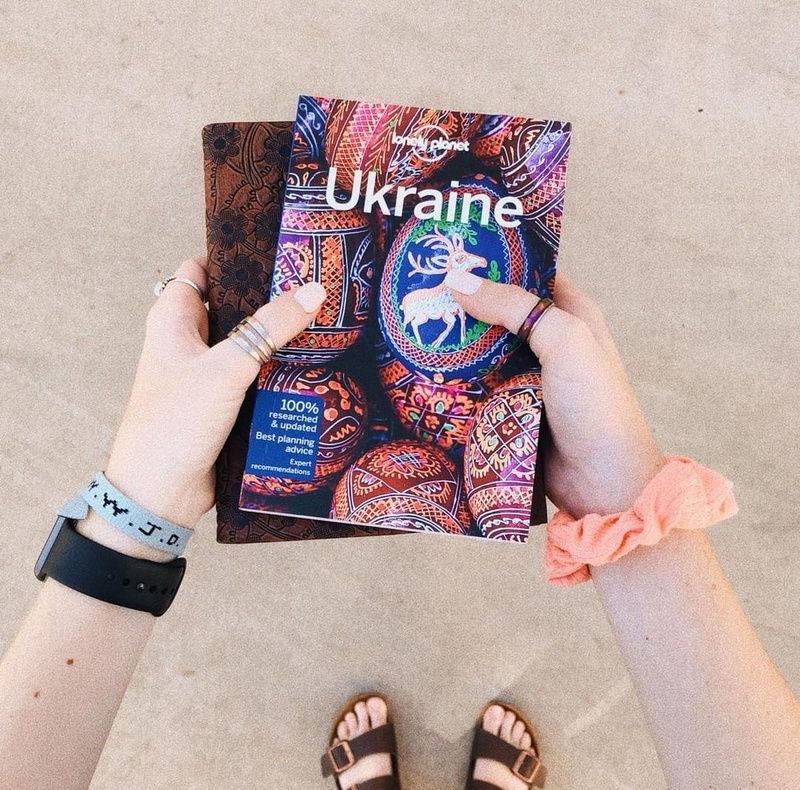 Convinced you need more of Ukraine in your life? Pst: traveling in other spots in Europe? This European Destination Guide helps you map out what to see. With any capital city, there are some spots worth skipping out on if you are short on time and other areas that you would only hear about if you have the inside scoop. Boryspil Airport (Airport code KBP) is your best bet. Found 20 miles outside of the city, once you land you can easily catch a taxi (go to a taxi call and they’ll quote you a price - around 400 UAH - to get you into the city). You can also take a public bus which is much cheaper. The Sky Bus picks up outside of Terminal D every 15 minutes or so. 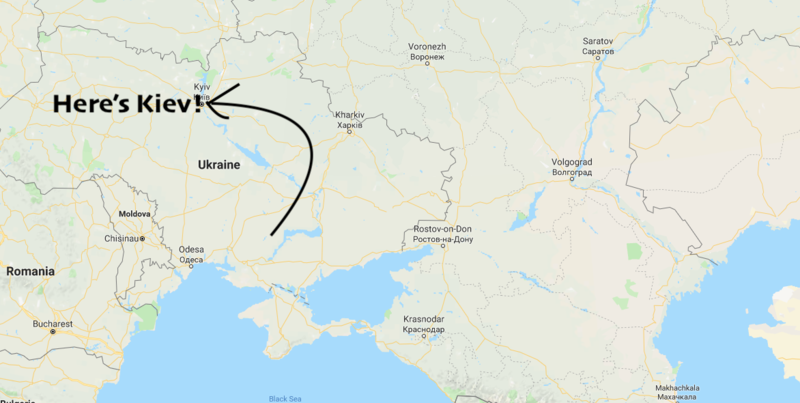 The journey is about an hour long and costs 50-80 UAH depending on your stop: 50 for the Khakivska Metro Station, or 80 for a stop at Kiev Train Station. From both those stations, you can hop on the metro and get to where you’re headed. KBP is the larger airport, but you can also fly into Igor Sikorsky Kyiv International Airport (IEV); it mostly serves budget airlines from other cities in Europe. You can take a taxi to and from the airport from the city, but it’s cheaper to take a bus then the metro. Trolleybus number 22 picks up at the airport and drops you off on line 3 of the metro, at the Dorohozhychi station. Bus 78 connects the airport with the Vasylkivska station of Metro Line 2. Bus tickets are around 8 UAH — pay the driver directly. Kiev is actually a major hub for so many budget airlines. This post may help you find great deals on flights to and from Ukraine. You can also head into Kiev via train: there are domestic as well as international trains that will get you to Ukraine’s capital city. This is a helpful sit for booking train transportation in Ukraine. The Kiev Passenger Railway Station is where you should be headed: The station is separated into a Northern hub and a Southern hub, connected via bridge. Get here via the metro, just hop off at the Vokzalna Metro Station (Line 1, the Red Line). Thanks to the metro, it’s simple to get around. There is a pretty extensive bus system too. One caveat to realize is that metro signs (and other signs in the city) will be in the Cyrillic alphabet. It may be helpful to know the alphabet to help you get around, but downloading the EasyWay app can help you manage the bus system and the 2GIS app works kind of like Google Maps to help you get around via metro, bus, or walking. Get 2GIS for Android here and here for IOS. Get EasyWay here for Android and here for Apple. There is also Uber in Kiev so you can use that to get around as well. Don’t miss your chance to really explore what the metro has to offer; Kiev is home to the deepest metro stop in the entire world (Arsenalna) and other stops are even protected by the government, and are home to impressive works of art, stunning chandeliers, and stately statues. Get a little more info about the prettiest metro stops in Kiev (and Moscow, Russia!) here. 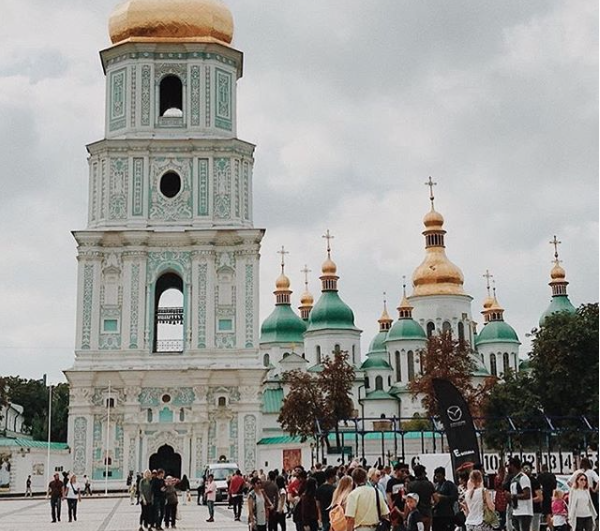 If you've researched Kiev at all, you've probably seen incredible photos of the Lavra. We love it. You should see it. Here's a guide with tons of tips. One of Kiev’s biggest selling points is how pretty the city is. In sections, you’ll find communist-block apartments reminiscent of a difficult past, and modern skyscrapers, but in sections you’ll see towering, onion-domed cathedrals, painted a rainbow of colors. In the past, something we recommend our volunteers do on a Saturday is just walk around downtown and go exploring, walking towards the spires that a peep over the rest of the city. Once you find the cathedral you’re looking for, spy another stack of onion domes and explore on your way over. 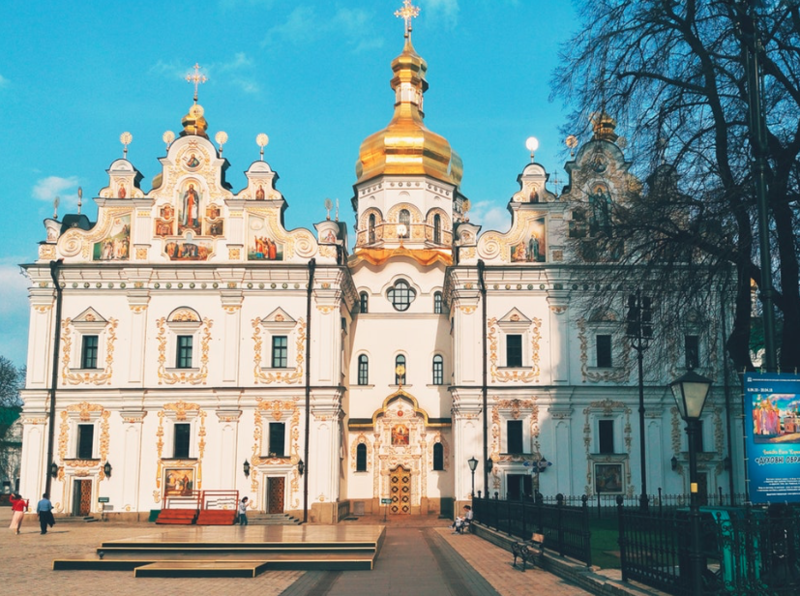 Check out our guide to our favorite cathedrals in Kiev. 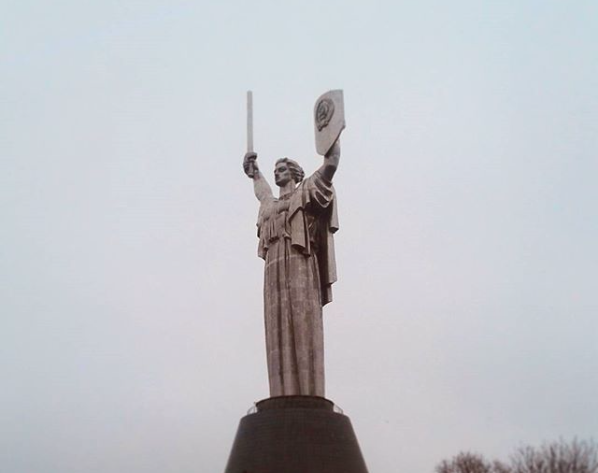 Called the Motherland Statue or the Rodina Mat, this impressive structure towers over a must-see museum for the Great Patriotic War (we know it as World War II). The statue and museum itself is quite representative of Ukrainian culture, plus the grounds surrounding the museum and statue are lovely to walk around; it's in a pretty picturesque portion of Kiev. We have detailed directions to the Rodina Mat here. Kiev is a center for the arts, and one item on your to-do list is to see a ballet while you are in town. 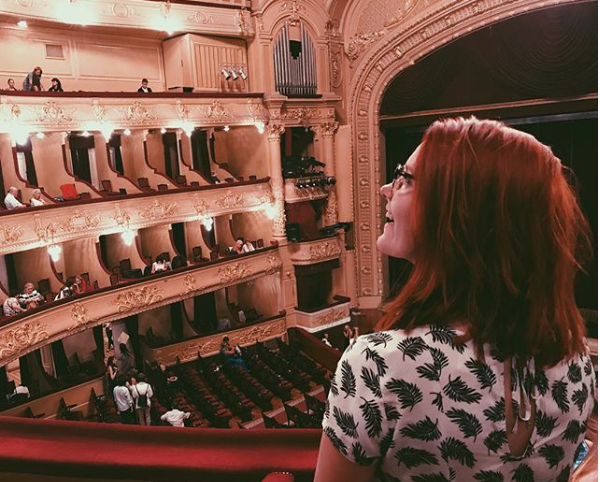 Even if you don’t have time to see a show, be sure to admire the National Opera House: it’s a stunning piece of architecture that’s nearly as gorgeous outside as it is inside. But the arts don’t end at the Ballet: Kiev is also famous for world-class puppet shoes, operas and plays. Here are our picks for the fine arts in Kiev. The city also boasts its fair share of impressive museums. 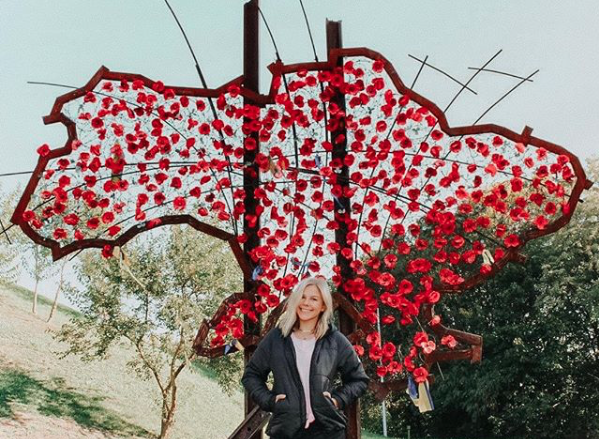 For a country that has had an expansive history, you’d be missing out if you didn’t go to see some of the relics and piece that showcase what has happened in Ukraine to shape the country you experience today. Though you have quite the selection, we suggest visiting the more historically minded, like the one by the Rodina Mat. If you’d like to see Kiev from a bird’s eye view, you can visit the city in miniature located in Hidropark (take the Hidropark metro stop, open from 10:00 - 5:00, with a 15 UAH admission). If you’d rather not stay indoors to see pieces of art making a statement on Ukraine’s history, you always admire the fantastic murals found in Kiev. Whether you’re looking to admire where the locals are shopping, stopping to see one of Kiev’s most iconic streets, or want a place to shop for classic Ukrainian souvenirs, a trip down a shopping street or two is a useful part of your itinerary. For window shopping, Kreshchatyk Street is your go-to. An expansive pedestrian only route, you’ll find the streets bookended with luxurious storefronts. The street often holds the title of one of the most expensive streets in Europe, but it’s fun to window shop, right? There are also vendors and festivals that pop up along the street. Get more info here. For clothes shopping, visit Vsi Svoi. That post has all the details you need, but in a nutshell, it’s the biggest store selling Ukrainian brands, so you’ll be able to come home with a bit of Ukraine after contributing to support local artists and designers. For souvenir shopping (to pick up painted eggs, nesting dollars, and embroidered scarves, etc) head to Andriyivsky Street; This large walking and shopping street curves down a picturesque road lined with colorful buildings ... see the picture? It’s opened every day, but you may find cheaper prices on the weekends. You also get a stellar view of St. Andrew’s Cathedral, so you’ll probably be in the neighborhood here anyways. — Getting Here: Ride the metro and get off at “Pochtovaya Ploshchad” then you’ll take the funicular Mikhailovskaya Square, and then go down the Trehsvyatitelskaya Street until you get arrive. Or you can walk from the metro stop “Kontraktovaya Ploshchad”. There are tons of destinations close to Kiev that we love to go exploring over the weekend or even just as a day trip. 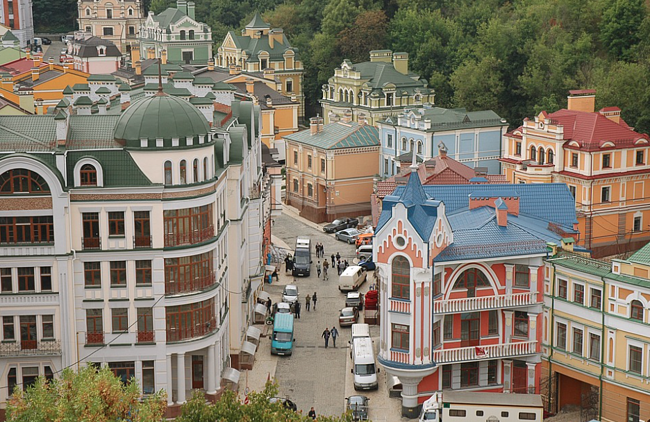 Check out our favorite day 1 or 2 day trips from Kiev. The ideas above just give you a taste of what this city has to offer, but of course there is more to do. Maybe you’d like to see what the Church of Jesus Christ of Latter-Day Saints temple looks like. We also have a compilation of 10 favorite things to do in Kiev, Ukraine that are also worth recommending if you have the time. Things like the eccentric House of Chimaeras or the expansive Botanic Gardens are a few additions worthy of your time! Like any major city, there are hundreds of options of places to stay. Our volunteers who are visiting tend to prefer some budget options, so splitting an AirBnB is always a good go-to, but here are some recommended hostels if you’re interested in checking these out. This hostel has an excellent location, right on Khreschatyk street. The rooms are bright and basic, with dorm room prices around $8 a night. Another popular spot, this hostel feels more like hostel in some aspects than a backpacker’s hostel. You’ll find a good location, helpful staff, and hundreds of positive reviews with dorm prices around $8-$11 a night. The Georgian meal to fall in love with. A traditional dish of cheese filled bread (and often topped with a soft eggs) this meal warms you up from the inside out. You’ll find quite a few places to try this dish, but volunteers are partial to a place called Chachapuri. Kebabs are quite popular in Ukraine (and all over Eastern Europe actually) and Musafir is a favorite spot to get this grab-and-go meal. Plus, there are varieties to fit any palate, including chicken kebabs, beef kabobs, and even vegetables ones. Oh, and if you’re not in the mood for kebabs, you can also find soups and desserts at Musafir, too. The chocolate here gets its own category. If you’re into trying a bunch of different kinds, we suggest checking out a local grocery store and stocking up on the favorites. But if you’re in the mood for chocolate desserts, look no further than Lviv Chocolate Factory. This sumptuous cafe serves up cups of melted chocolate, layered brownies, and decadent cakes. Get more info about the Lviv Chocolate Factory here. The Cake is an eatery our volunteers love — the desserts here are delicious, creative and whimsical (and some are definitely worthy of your Instagram feed): think bubble gum lattes and mirror glaze mini cakes. The menu also supports some delicious breakfast options, and drinks too. An ideal spot to try something like a black currant cake, bubble tea, or a stack of french toast. Spotykach is one of the restaurants where you’ll find typical Ukrainian food. Our volunteers are partial to the dumplings, but you’ll also find dishes like beef stroganoff over rice, stuffed cabbage rolls, Kiev borscht, chicken Kiev, buckwheat with mushrooms and other classics. Chicken Kyiv is another post for local dishes, this restaurant is one of the best places to get Chicken Kyiv, though their breakfast menu is also popular. Come for freshly baked rye bread, Olivier salad, Varenyky (stuffed dumplings), borscht, soup with dumplings, and more. Get a few more Kiev restaurant recommendations here. The city is hiding a couple of undiscovered gems that you might want to explore. One whimsical park is “Alice In Wonderland” themed, complete with colorful sculptures and found just outside of the center of Kiev. We have more details about the Alice In Wonderland park here if you want some unique portraits for your Instagram feed. There’s a majority of travelers vacationing with an international data plan but if that’s not you, or you don’t want to use up your data, you can hang around these places for free Wifi in Kiev. On a budget? Check out 10 free things to do in Kiev! 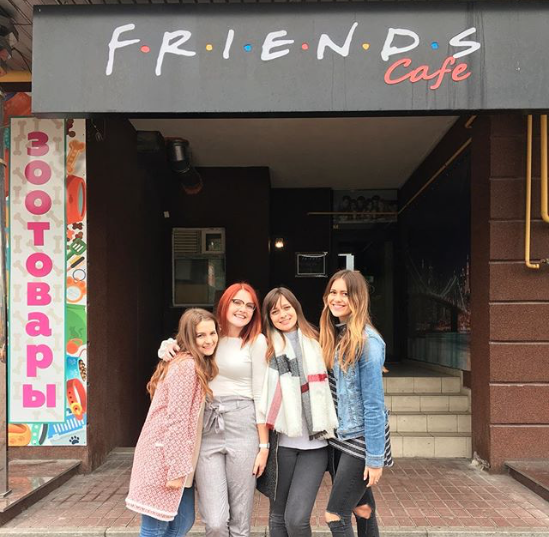 A few days in Kiev will certainly get you a taste of this incredible European destination, but over and over ILP volunteers who live in Ukraine for a semester rave about it! 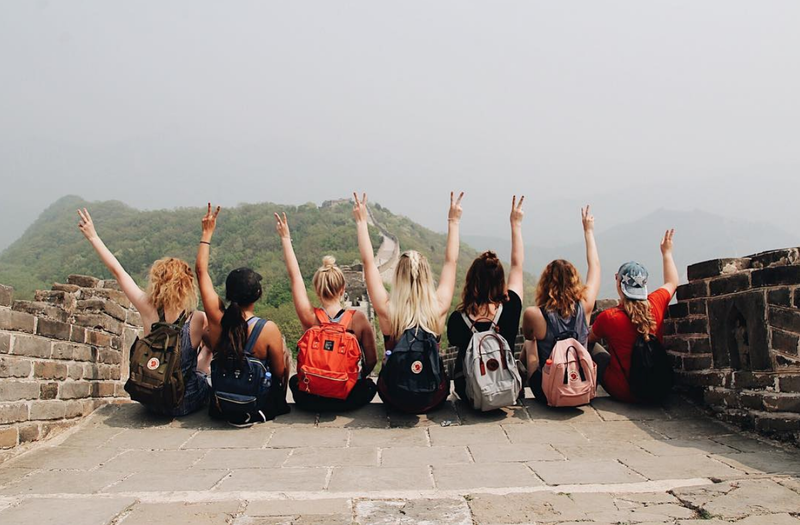 Sticking around for 4 months to teach English to the cute local kids, living with a host family, and traveling around the country with a group of other volunteers like you - well that's really the way to soak up the culture here! 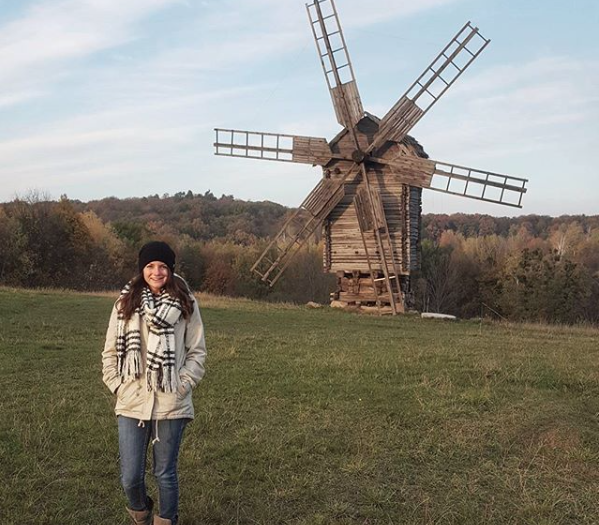 Click below to learn more about spending a semester volunteering in Ukraine with International Language Programs!